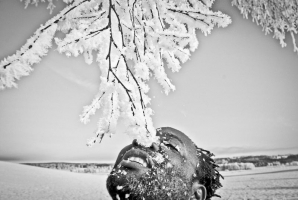 Winner of the Alfred Fried Photography Award's world-best picture on the theme of peace, the Peace Image of the Year, worth € 10000, is Cletus Nelson Nwadike, Sweden, with an image from his work "Peace is the greatest thing!" with his image "Taking a stand in Baton Rouge"
A young woman in a summer dress stands in a deserted street, with her arms crossed. 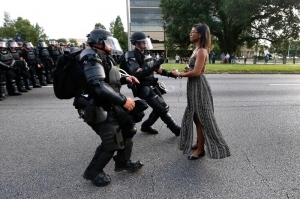 As two policemen in warlike uniforms charge towards her, she makes a point of holding out her hands. She stands completely still. Defenceless and courageous. Peaceful. Then she is taken away towards a phalanx of police warriors lined up like a wall. It is a hot afternoon, 38 °C, on July 9, 2016 in Baton Rouge, Louisiana. The young woman is Ieshia Evans, a nurse, mother of a child. She came from Pennsylvania to protest against the deadly police violence aimed at black people. Against an obvious racism. Black life matters! At a time when proof of blood, sweat and tears have become symbols of the present situation this picture of this peaceful, upright woman in the street has become a symbol of something which luckily still exists in this world: moral courage and pride. No, it is not just the murderers and warriors and despots who are part of our present life, but it is also those who put up a fight. Those who do not say that there is no alternative to declarations of war, brutality and the law of the jungle. The photographer Jonathan Bachman has created an icon with the picture of Ieshia Evans, a picture – small in itself but representing something great. Over 200 years without war – Cletus Nelson Nwadike could not have chosen a better country than Sweden to flee to. He was born in 1966 in Nigeria into a bloodbath which began shortly afterwards and lasted until 1970, killing two million people and leaving endless darkness. Nwadike fled from this horror as soon as he was able to. And he who loved a camera even as an eleven-year old boy, being allowed to take photos of the most beautiful girls of the village; he who says “taking pictures keeps me alive”; he went to Sweden and studied visual communication at Jönköping university. Sweden! He still is very happy there. With a family who does not have to fear for their lives. With pictures which are not burnt by a looting soldier. With men who may get older than 52, like his father or 48 like his grandfather of whom Nwadike doesn’t even have a photo. Sweden. The taste of snow. The glittering trees. The path without dangers. The joie de vivre. “Peace is the greatest thing,” sings Nwadike for the snowflakes falling from the sky at night. “If you decide to carry me away I will show you the bridges: And your strong foot will be my leg, and my seeing eye will be yours.” One person can see, another can walk - thus the lame and the blind start to help each other live their lives. A poem from the 18th century. Liu Hai and Li Meiwen probably won't know it because they live in 21st century China. None of them is blind. But Liu Hai has lost his arms, and Li Meiwen her legs. And they live what this forgotten poem of a German moral philosopher wants to express: “Together this couple functions in a way which none of them could have done on their own.” Love of imperfect people. They complement each other, they share, they support each other, they are the other’s hand. They are weak on their own, but together they are strong. The have conceived a child. They are a picture of peace. To make peace with something – a phrase that smacks of modesty, not revealing whether one has made this peace voluntarily or under duress. Whether one has capitulated or reached an understanding. The two eleven-year old girls Lúa and Nandini have also suffered losses in their lifetimes. Lúa was still a baby when her Venezuelan mother left. Nandini’s Indian father left his wife. 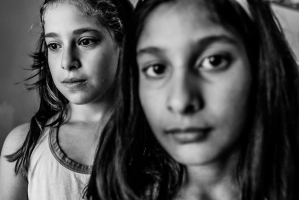 The girls got to know each other in a hostel for asylum seekers in the Dutch town of Amersfoort. Not exactly what a child dreams of. How can one make peace with that? Lúa and Nandini have fought their agony. They have approached each other and became friends. They infect each other with their cheerfulness and they share their ideas. And they are planning to forge a new family out of their remaining family members. They make their difficult situation dance. When he was on vacation at the Tunisian island of Djerba, he looked out of the window and saw them: filigreed fragile buildings in the sand. Airy, short-lived constructions, minimalist architecture. They reminded him a bit of the ‘objects trouvés’ of the surrealists. And what were they in fact? 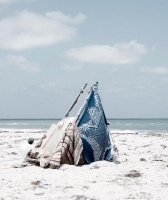 Improvised one-day accommodation, temporary homes, nomadic installations of local beach goers, brought here on motorbikes, cars, donkeys. Now one might ask what is the peace aspect of this picture apart from the peace which the skin is supposed to make with the scorching sun. But for Yoann Cimier this was not the question. He discovered true poetry in these rudimentary homes, the carefreeness of their builders, the diversity of their creators. The beauty of lucid moments and days quite innocently spent by the seaside – which, as we know, has turned into a mass grave in other parts of the world. Here, however, forgetting is allowed. Peace.